MBP "Smart Drive XL" Power Trim Adjustable Struts. These works well in twin motor catamarans that have a transom with a long overhang. 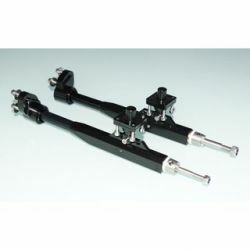 Length: Adjustable from 145mm (5.7") to - 187mm (7.36"). 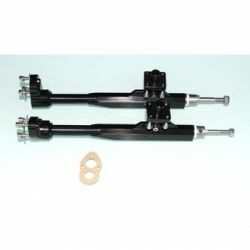 (2) Struts with prop shafts for 3/16" (4.75mm) propellers. Customer to supply .250 (6.35mm) flex cable and glue or solder into propeller shaft. MBP Picture shows no space in between drive dog and strut. OSE suggests 3-4mm of space in this area to stop binding when the flex cable contacts under load.